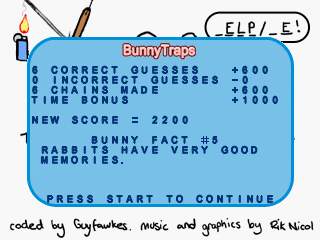 Bunny Traps is basically Hangman with some twists. 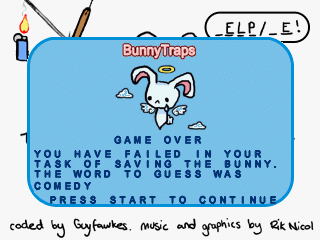 It follows the same format as Hangman in which you have to guess the word by entering the correct letters but instead of saving the character from being hung you must save Bunny from ten dangerous situations. I won't give too much away on what the situations are as you will need to unlock these by guessing the correct word for each one. Two examples are shown in the screenshots below. 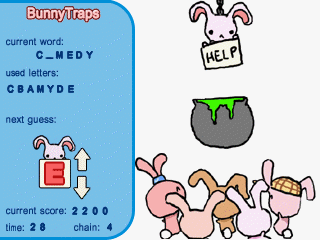 As mentioned there are ten dangerous situations for Bunny to escape from. Each one has seven scenes, the first five are for the failed guesses and two are the winning and loosing scene. critical - I just downloaded and played it. 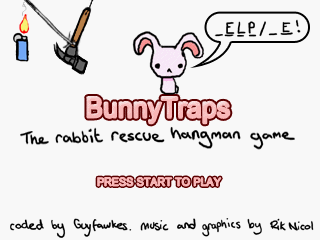 An excellent job guys - very slick, funny, simple to play and engaging. Thanks for sharing your hard work. Horscht - Man, you gotta love this game. Awesome dude. ThorC - Very nice, thoroughly enjoying it, and a great game to have when mobile - Nice work!